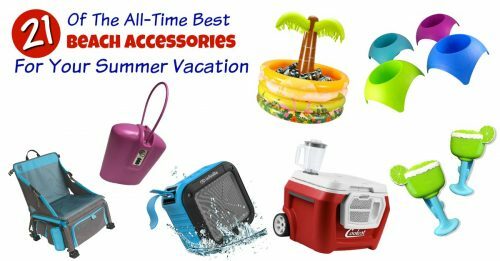 Heading to the pool or beach this summer? 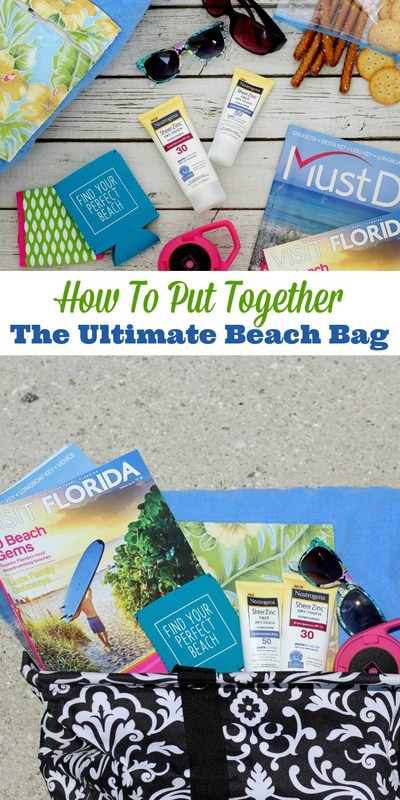 Find out exactly what you need to include when you put together the ultimate beach bag. When we lived in Atlanta, we didn’t get many house guests. However, that all changed when we moved to Florida. I’d like to think that it’s because our friends and family love us so much but the fact that we live near so many beautiful beaches may have a little something to do with it. Usually when people visit, hanging by the pool or heading to the beach is a priority. I try to make sure they have everything they need so I’ve put together the perfect beach bag. Instead of scrambling around for sunscreen or towels, my guests will be ready to go at a moments notice. 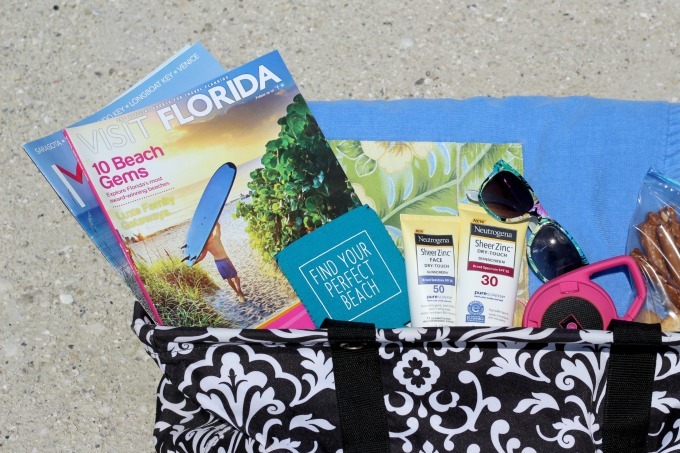 Of course, the most important item for any beach bag is the sunscreen. It gets seriously hot here and you cannot visit the beaches without it. One thing I’ve discovered is that not all sunscreens are created equal…get the wrong kind and you just might regret it. 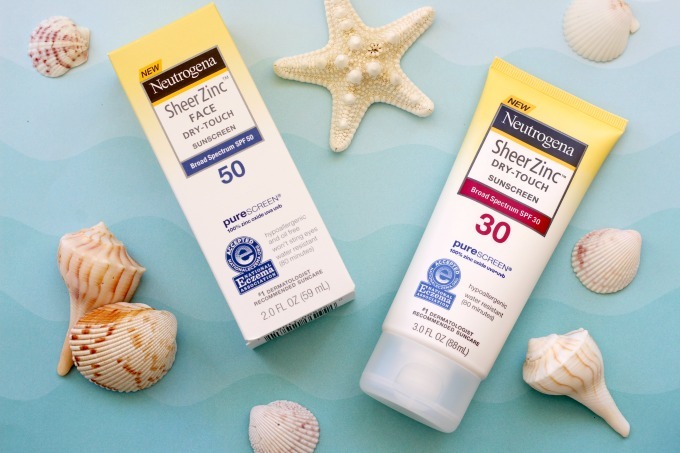 Since I’ve used Neutrogena products for years, I know I can trust them and was excited to try out the Neutrogena Sheer Zinc® sunscreens. I picked up Sheer Zinc Face with SPF 50 because I like a little extra protection for my face. For everything else, Sheer Zinc with SPF 30 is perfect. Another reason I trust these sunscreens is because they’ve been awarded the National Eczema Association Seal Of Acceptance for people with sensitive skin. These are the only sunscreens to feature breakthrough Purescreen technology with naturally sourced 100% zinc oxide. They’re also hypoallergenic, sweat and water resistant for up to 80 minutes and won’t clog your pores. I found mine in the sunscreen aisle at Target. Towels This is a given right? How else are you going to dry off after splashing around in the pool or ocean? Bluetooth Speaker Good tunes are a must and my little pink bluetooth speaker is perfect. It’s perfect for streaming your favorite music from your phone. Reading Material I always throw in a couple local magazines so my guests can see what’s going on around town. Sunglasses Most people bring their own but it’s always good to have extras on hand. Snacks All that relaxing in the sun can make a person hungry. Koozies These are a must-have because nobody wants warm drinks on the beach. You can also throw in hats or visors, ponytail holders, lip balm or anything else that you think might come in handy. What else would you pack in your ultimate beach bag? 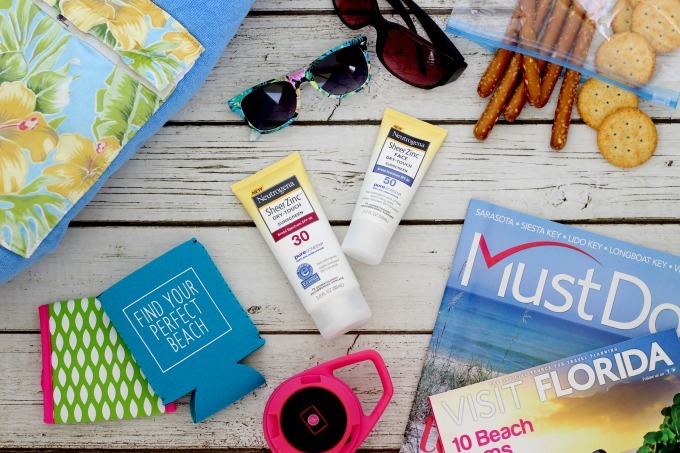 Want to learn more about Neutrogena Sheer Zinc sunscreens and other products? Check them out on Facebook, Instagram, Twitter and YouTube. Does the zinc sunscreen turn a milky white when it gets wet? That’s why I don’t buy zinc products anymore. It is a milky white at first but fades pretty quickly.